The original Hall of Fame is one of the most popular reverb pedals we've seen. 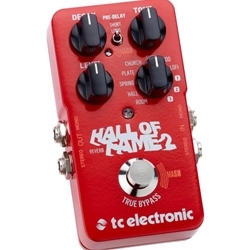 The TC Electronic Hall of Fame 2 reverb pedal delivers new shimmer reverb algorithms and an innovative Mash footswitch for expressive effects. In addition to toggling the reverb effect on and off, the Mash footswitch is pressure-sensitive so you can use it like an expression pedal to control reverb parameters. And fans of TonePrint effects presets can rejoice â€” the Hall of Fame 2 reverb pedal boasts three slots for TonePrint presets, allowing you to have three custom-tailored reverb effects at the ready.